I’ve been wanting to make quinoa (pronounced “KEEN-wah”) in the Instant Pot since I got it. It's one of my go-to side dishes for years. Did you know that quinoa is not actually a grain, but a seed? I just like using it as a easy to prepare, gluten-free option that’s awesome to bulk up a meal. Healthy: It’s jammed pack of vitamins and nutrients. For example, quinoa is high in fiber, iron, protein, and manganese, which contributes to maintaining healthy bones. Cauliflower is full of nutrients. For instance, it's high in vitamin C, vitamin K, and folate, and very low in calories. 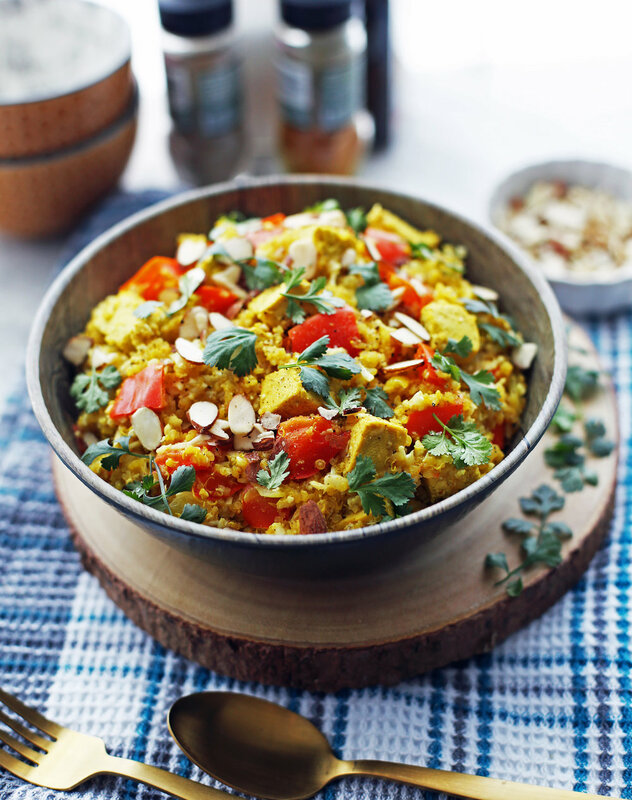 Flavourful: The lovely spices including ground turmeric, cumin, and coriander absorbs into the ingredients and gives the firm tofu, slightly nutty white quinoa, and cauliflower rice a pretty golden-yellow colour. This combination of spices is fragrant and very mild in spicy-heat. Turmeric, which also has anti-inflammatory properties, features a pungent (almost mustardy), and earthy-sweet taste, cumin is earthy, mildly spicy and peppery, and coriander has earthy and lemony flavours. To add, the zesty and bright profile of lemon juice and citrusy, aromatic fresh cilantro heightens the overall flavours of this filling meal. If you dislike cilantro, you can substitute with parsley or leave it out all together. Aromatic sautéed onions, garlic, and ginger provide savoury, mildly sweet and spicy notes that give the meal a rich umami flavour. The chopped red bell pepper gives the dish a mild sweetness too. All the ingredients for this tasty and nutritious Instant Pot meal that's perfect as a main dish or as a side dish! Full ingredients quantities and complete instructions listed in the recipe card below. 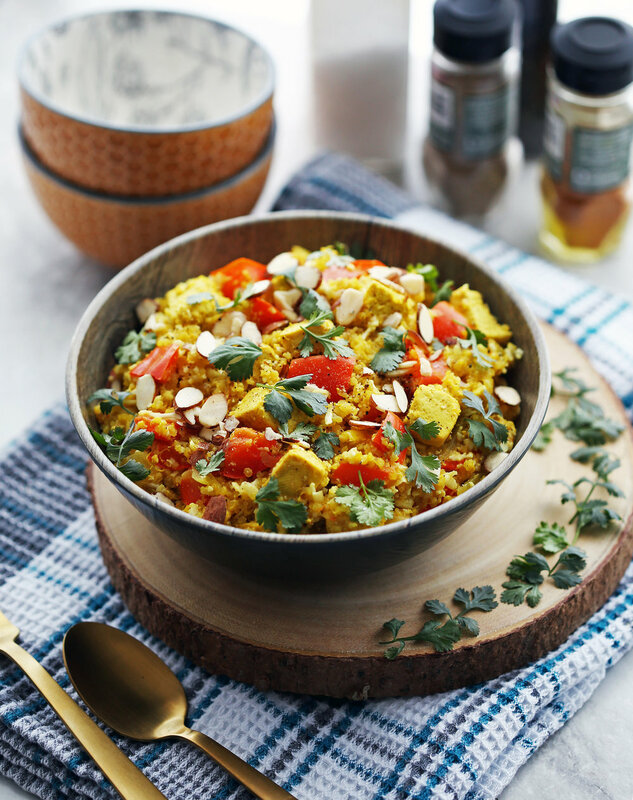 Full of different textures: chewy yet creamy curly-tailed quinoa, tender tofu and bell pepper, tender-crisp cauliflower rice, and crunchy almonds give this dish a wonderful mix of textures that’s different with each bite. Fast and easy to make: It’s simple to prepare and it only takes one minute at high pressure in the Instant Pot! Vegan and gluten-free: A great option for those with these dietary restrictions. When looking for tofu, be mindful to ensure the variety you select is free of ingredients (e.g. flavourings) that may contain gluten. Sautéed onions, garlic, and ginger with toasted quinoa, fragrant spices, red bell pepper, and tofu that's ready to cook in the Instant Pot. Only ONE MINUTE at high pressure! The quinoa is perfectly cooked (chewy and fluffy), the tofu and bell pepper are tender, but holds it's shape. The cauliflower rice is to the side and is ready to be mixed in with the rest of ingredients to heat up and soften slightly. Tip: If using a fresh cauliflower, look for a creamy white, compact body with firm green leaves at its base; avoid spotted, dull (grey) coloured cauliflower. If you are making cauliflower rice from a whole cauliflower, remove the green leaves and hard root base, and cut into large pieces. Rice the cauliflower by using a food processor fitted with the grater attachment (that’s what I did) or by using a box grater with medium-holes (the ones used to grate cheese), to grate the cauliflower into the size of rice. I like to do this as the quinoa cooks in the Instant Pot. Why not add in the cauliflower rice with the quinoa to cook in the Instant Pot? It will turn the cauliflower into mash. Our first batch contained cauliflower florets with the quinoa mixture and it broke down quite easily into a soft mushy mixture even after only one minute of high pressure in the Instant Pot. Adding the cauliflower rice in the end and letting it rest in the heat of the quinoa will allow it to maintain its shape and produce a nice tender-crisp texture. I hope you enjoy this recipe! If you try this recipe, please leave a comment and rating below or comment on any of my social media! Using the “sauté” function on the Instant Pot, add olive oil and sauté onions until soft and lightly browned, about 2-3 minutes. Add in quinoa, garlic, ginger and stir for another minute or two to allow the quinoa to lightly toast. Then stir in the spices, including salt and pepper, until fragrant, about 30 seconds. Deglaze by pouring in 2 tablespoons of broth, stirring and scraping the bottom of pot to remove/dissolve any brown bits. Add in the tofu, bell pepper, and remaining broth into the pot. Give the ingredients a good stir to distribute throughout the vessel. Press “cancel” to turn off the Instant Pot. Seal the Instant Pot and cook at high pressure (“manual”/"pressure cook" function) for 1 minute ***(see third note). After it is ready, allow natural pressure release for 5 minutes before quick pressure release to completely depressurize (until floating valve drops). Open the Instant Pot and stir in the cauliflower rice with the rest of the ingredients *(see first note). Cover with the lid (do not seal) and let it sit for 5 minutes to allow the cauliflower rice to soften slightly (tender crisp) in the heat. Last, add in the sliced almond, fresh cilantro, lemon juice and give it a gentle stir *(see second note). Taste for additional salt and pepper. Scoop into bowls and serve warm. *I used a half of a medium cauliflower. If using a fresh cauliflower, remove the green leaves and hard root base, and cut into large pieces. Rice the cauliflower by using a food processor fitted with the grater attachment (that’s what I did) or by using a box grater with medium-holes (the ones used to grate cheese), to grate the cauliflower into the size of rice. I like to do this as the quinoa cooks in the Instant Pot. **One medium lemon produces around ¼ cup of lemon juice. I tend to like a lemony dish so I used a full lemon amount of juice. Adjust according to preference. 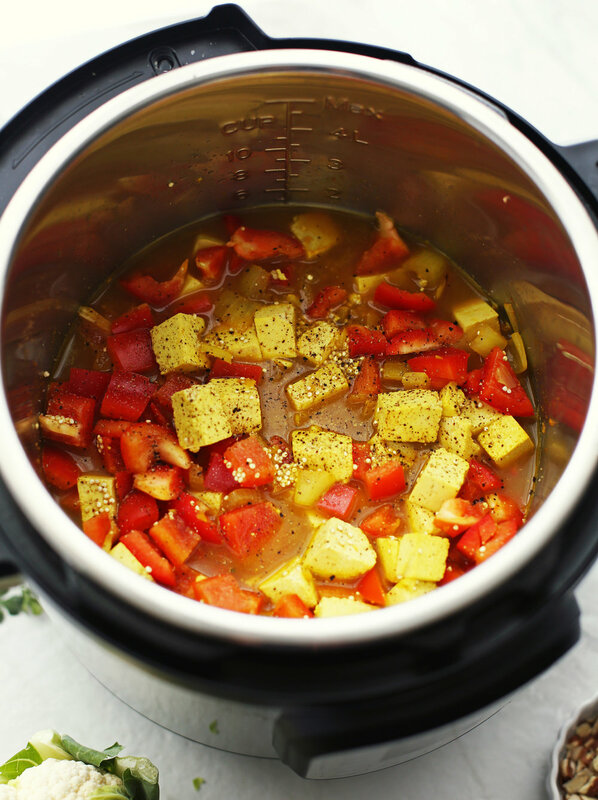 ***It takes 10-15 minutes for the Instant Pot to come to pressure.